Introverted Feeling (Fi): Tracey lives life his own way. When he meets Ash and Misty, he is following his passion of watching and drawing wild Pokemon. 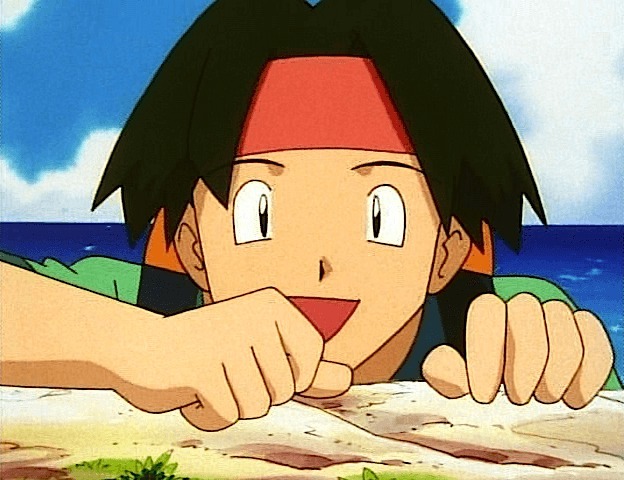 He is very emotional and caring toward those he cares about, but is often oblivious of others’ emotions; he once made an indiscreet comment suggesting that Ash and Misty were in love, provoking an angry response from both of them. He cares very much about Professor Oak’s opinion of his work, owing to the respect he has for the veteran researcher; he cannot contain his nerves when the famed Pokemon Professor reviews his drawings for the first time. Extroverted Sensing (Se): Tracey has a talent for drawing Pokemon he sees, down to the most minute detail. This comes from an acute awareness of Pokemon and their environments. He can notice subtle differences in coloration or other physical characteristics that indicate either good or poor health. This also extends to humans; when seeing a Nurse Joy paddling in a boat toward him, he immediately sees that her biceps are larger than average for a Nurse Joy. He can pick up on subtle movements to determine what move a Pokemon will use a split second earlier than most people would. Introverted Intuition (Ni): Although not particularly focused on the long term, Tracey can concentrate on a sketch he is working on long enough to draw a complete picture. When he has no Pokemon in sight to draw, he will actively track one down. When searching with Ash and Misty, Tracey successfully tracked down and found the Crystal Onix, a special Pokemon said to give inspiration for local glassblowers. Extroverted Thinking (Te): Tracey is not ambitious or controlling, but he does take action on what he wants. He decides to travel with Ash and Misty without even consulting them upon hearing that they know Professor Oak. When the three of them arrive in Pallet Town, Tracey decides to stay there as Professor Oak’s assistant. He can effectively take care of the lab in Professor Oak’s absence, implying that he does have some organizational skills.